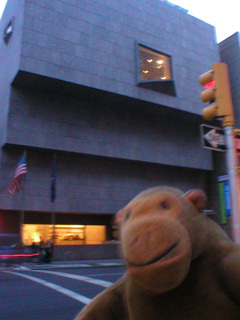 "They've got a room of Hoppers, but it's not a big room"
Mr Monkey trotted along Madison Avenue, where he went into the Whitney Museum of American Art, to see the American art collected by Gertrude Vanderbilt Whitney. He looked at the art in several galleries, including work by Edward Hopper and Reginald Marsh, in the slightly strangely shaped museum. 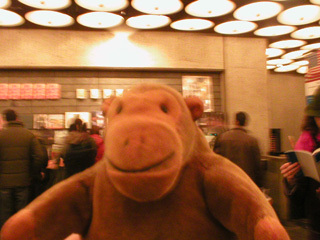 He wasn't allowed to take pictures anywhere except in the lobby, which was a shame. You can read about the gallery at the Whitney Museum of American Art website.